RN4870 click carries the RN4870 Bluetooth® 4.2 low energy module from Microchip. The click is designed to run on a 3.3V power supply. It uses ASCII Command Interface over UART for communication with target microcontroller, with additional functionality provided by the following pins on the mikroBUS™ line: PWM, INT, RST, CS. 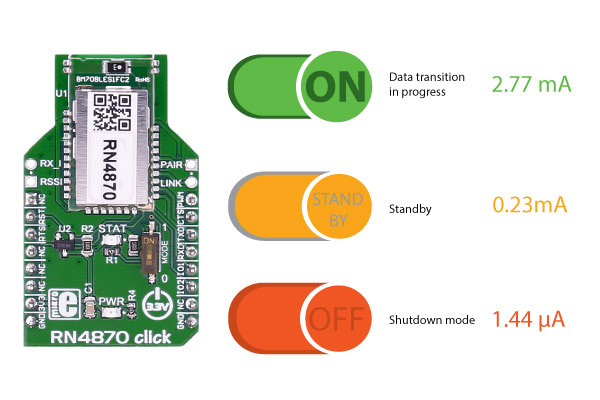 The RN4080 module from Microchip provides a complete solution to implement Bluetooth 4.2 Low Energy connectivity. The RN4870 supports both peripheral and central Generic Access Profile (GAP) roles, actively scanning for other connectable devices instead of waiting for incoming connection requests. The peripherals are usually small, low power devices like sensors and monitors, that broadcast information to the central device. The central device can communicate with multiple peripherals. It also supports Remote Command mode which allows a remote device to access Command mode remotely via Bluetooth link.